Come and get your free samples…each and every day, mmkay? Fargo, ND – The FM Observer has learned from our last year’s annual survey that a large number of area college students who are often living on a rather tight budget regularly eat for free at the Costso store. Franseska Thrice, who’s studying Animal Sciences at NDSU, admits that just by sauntering through Costco and sometimes Sam’s Club, enough calories can be ingested to support life on an on-going basis. 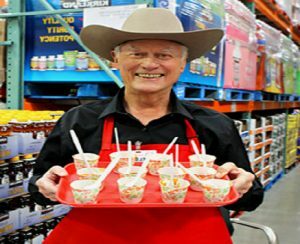 Costco is currently reviewing its long-standing policy of offering free samples to its customers. “We might have to start charging for our ‘free’ samples if we see an increasing trend of abuse by the college agers,” says an interactive company spokesbot.